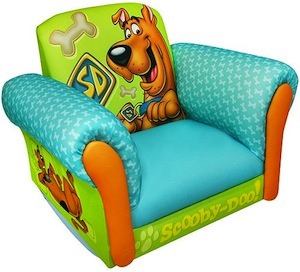 If your kids love Scooby-Doo then they will love this chair. This kids rocking chair has pictures of Scooby-Doo all over them and even dog bones on the arm rests. Don’t expect a cheap quality product this chair is has a wood frame with nice foam and easy to clean fabric and comes with 5 years warranty. Kids need a nice chair to sit in to and this one rocks so it will be even more fun while watching Scooby on TV. Come check out this Scooby-Doo Rocking Chair.